This video is circling the internet today and it resonated vastly with a thought I was having this morning. You can no longer isolate yourself in your own country, shut the blinds on the global community and not care. Every week, several times a week, there a devastating news abut the impacts of climate change. And there are good news. But what the heartbreaking and the hope giving news have in common is, that it is global news. The loss is global, and the gain is global. We all need to see beyond language and borders if we are to decide what role humanity has on this planet. The terror attack in Paris was no doubt tragic, heartbreaking , and unjust. In the days that followed environmentalist around the world voiced our concern, that this would take focus from COP21 and belittle our need for a climate change agreement. Yesterday it was published, that the Parisian police will not allow for a climate march in Paris due to security reasons. But the more people who protest the, better the chances of a climate agreement are. If you want to let your voice be heard, march. If you want to give the people of Paris a chance to let their voices be heard, march for them. In the weekend 28-29th of November, thousands of climate marches are taking place all over the world. To find the one nearest to you, simple go to globalclimatemarch.org and type your city. It’s the easiest thing in the world. You just show up. See you at the march. This is the second post on the subject of Loss Aversion. If you missed the first post about why environmental extremists are both inspirational and scary, read it here. What if I had nothing? Turning the question of loss aversion upside down, what would actually happen if you had nothing? Or at least less than you have now? Look around you. How many things would you really miss if you didn’t have them? A Danish television documentary aired last year about this subject. 4 people in their 20’s, gave up Everything they owned for 30 days –including their clothes. They were allowed to choose one thing each day, to take back. Not surprisingly, they all chose a onezy the first day. And then it got interesting. When you have to choose everything in your life very carefully, what do you choose first? The bed? Toothbrush? iPad? And more importantly, what would you actually miss? When you have covered all your basic needs, clothing, wallet, bed, hygiene products, do you still miss all the other things? The answer, not surprisingly, was no. It’s a very few things we actually miss once we’ve lost, or given them up. The fear of loss is much greater than the loss itself. When we read about people who seemingly give up a lot to live sustainable, we tell ourselves, that we would like to do the same, but we can’t possibly do it in reality. It’s scary. Those inspirational people have to be a bit crazy in order to give those things up, right? And you’re not crazy, you’re not that extreme. You will make the smart choice -recycle your waste instead. So the people who started out being an inspiration, have now almost turned into a scare tactic. That’s not to say you shouldn’t read and learn from these people, or even try to copy them. those were some extreme changes, right? The more people who actually adopt an “extreme” behavior, the faster it becomes the new norm. What was radical, extreme, and just too much yesterday, is called progress today. Getting really cheesy for a moment, Gandhi was right. So if you’re planning an environmental campaign, or pushing for environmental legislation, this is what you should do. Focus on the gains. Do not highlight, or ”sell” all the things you have to give up. We’ve all seen those campaigns. Do good for the environment! Stop this, cut down on that! Do it for the children! They don’t work. At best they leave us indifferent, a worst they distance us further for the problem, and hence from acting. Instead, put the focus on the positive derived effects, the things you gain. More happiness, more time. Better water quality. Fewer droughts. Higher job security. Better cash flow. A more stress-free life, longer life, more smiles in the mirror each morning. Don’t believe me? Here’s a link to an article about how people become happier when they recycle. Wait a second! Are you selling bulls***? If you’re thinking, ‘No way man! Doing good for the environment doesn’t have any positive side effects, at least not in my line of business’, I would like to challenge you to a duel, good sir. Or madam. The hidden costs of pollution and climate change are much, much greater than the current price tag. Hence, the positives effects of minimizing, or eliminating pollution, climate change, and other environmental issues, are greater than publicly debated. Go here for more info on the hidden cost of environmental services. If you feel your cause isn’t “selling”, take 20-30 min where you turn the situation up-side-down, What is the negative cost of not changing this behavior? What positive benefits are you not seeing? If you really can’t find any, post the issue in the comments, or mail it to me. I will try to find the highlights. If I can’t do this, I will send a great big gift basket to your office, and dedicate an entire blog post to you and your field. Make a list of the 20 things in your life that you could absolutely not go without. Did you actually make it to 20 without thinking, ‘Hmmm, this is actually a nice to have’? Now take the 10 things that are the least need on that list. What would be the worst outcome of losing them? And is that a realistic outcome? Would it really be so bad to give up those things? My guess is, that more than half of the things on your need list, should actually be on the nice list. Comment below on the most surprising finding. There you have it. Loss aversion keeps us from adopting what we find to be an extreme environmental behavior. Find the positive gains instead, and focus on them. And now that I’ve overspent my use of the word extreme, here is a treat for sticking around to the end of the post. I give you the Extreme Mix scene from Harrold and Kumar go to White Castle – With a special shout out to Jonhard West. Great news! The Netherlands just did something amazing in terms of climate policy. They sued their government – and won! I won’t go into details now, but in short, the lawsuit was brought under human rights laws by the sustainability foundation Urgenda, claiming that government need to take actual steps to prevent climate change, in order to protect it’s citizens. This means: the Dutch government can lo longer make promises about reducing greenhouse gas emissions, and not follow through. This news is groundbreaking in the field of climate policy, seeing as all former promised to reduce greenhouse gas, has been on a volunteer basis, with no consequences if the government failed. “It is also the first case in the world in which human rights are used as a legal basis to protect citizens against climate change.” – Urgenda. We have now entered a new era, in which citizens can prosecute their government for not taking the appropriate measures to combat climate change. 3rd world problems in a 1st world country – why more attention to mitigation is needed. Denmark has in recent years had above average rainfall resulting in above average flooding, many of them record breaking. 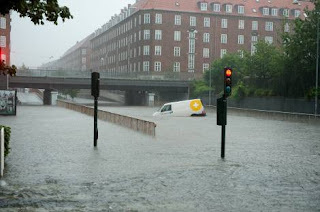 Like the extreme rainfall of July 2nd 2011 in Copenhagen that resulted in massive flooding all over the city and left 50.000 households without hot water. That amount of rain was described as a statistical abnormality, one that should only occur every 300-500 years (Director of water and sewage in Copenhagen’s energy department). The picture below is from that flooding. 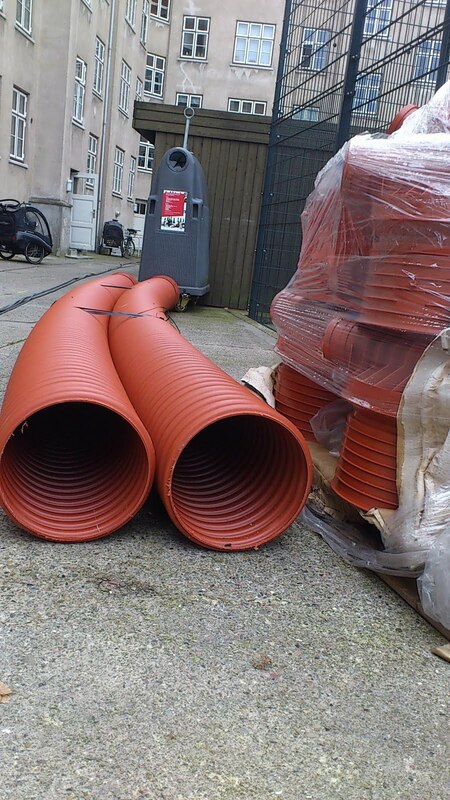 On August 14th Copenhagen again experienced heavy rainfall, this time with less flooding, but it was enough to damage the worn and old sewage system, and the fresh water pipelines came into contact with rain and sewage water. On the 18th of August a warning was issued in Copenhagen. Doe to water contamination citizens must boil the water before drinking it, showering in it or using it for dish or cloth washing. On the 23rd of August the problem still affected 40.000 citizens which still had to boil their water. It has been underlined that this was a special event, an unlikely combination of heavy rain and a malfunctioning pipeline. A double accident if you will. From a risk management view this isn’t something that should be feared because it’s too unlikely. Human beings have the flaw that we have trouble comprehending the damage of, and therefore ensuring ourselves against, a double accident. Another example of this is the near catastrophe that happened at the Fukushima nuclear power plant in Japan, March 2011. The plant had been insured against earthquakes and it had been insured against tsunamis and floods, but it hadn’t been insured against first being hit by an earthquake and then a tsunami. The thought of such a double accident was incomprehensible and therefore not planned for. On a much smaller scale, it’s the same with sewage systems. A busted pipe combined with a flooding. Unlikely, and therefore not planned for. Denmark is a 1st. word country, one that isn’t used to water contamination or having to import drinking water. We have good infrastructure and good health. Denmark is a well-oiled machinery that ensures its citizens an almost sickening level of security and comfort. But we have to make some swift decisions if we want to keep that up. The sewage problem must be delt with. 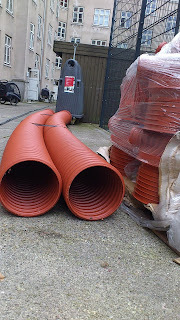 The pictures below are from my building block as it is gearing up to change some of the bad pipes. Sights like these are common in Copenhagen these days. Meanwhile the electoral race is on, and the hunt for votes has got the political parties presenting one elaborate plan after the other on how to best serve citizens. But not a single party or candidate has mentioned the sewage problem. 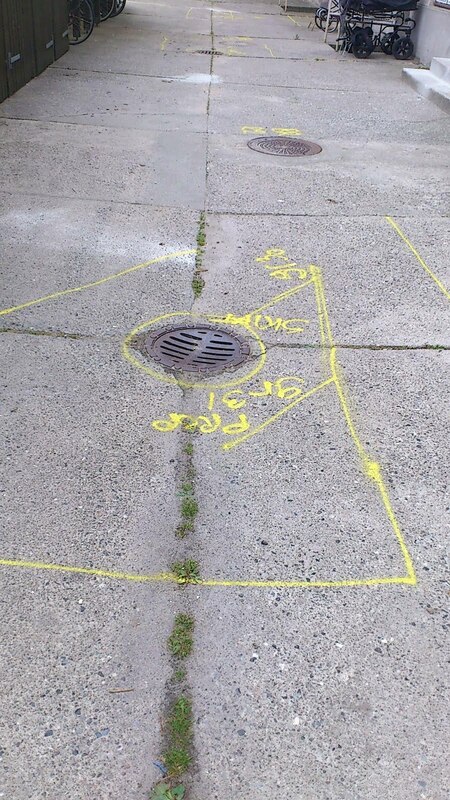 It’s commonly known that the added run-of from re-pavement of the city, combined with heavier rainfalls, exceed the capacity of the sewer, but still no one is addressing the problem. Mitigation needs to have a place on the public agenda next to health care and taxes, because ignoring the need for mitigation will only ad costs to our health and our national bugged. For once we actually need to talk more about the weather and how to deal with it. https://somethinggreen.org/wp-content/uploads/migrated_media/Skybrud_over_K_benh_557491x.jpg 212 320 Mona Jensen https://somethinggreen.org/wp-content/uploads/2016/12/something-green-1-1.png Mona Jensen2011-08-24 13:43:102015-06-22 13:49:403rd world problems in a 1st world country - why more attention to mitigation is needed. 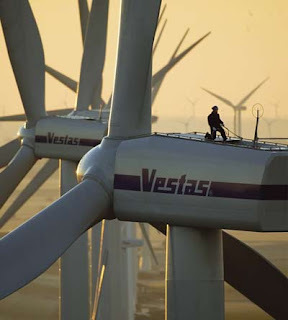 The following post argues that there will be no transformation in the energy sector, until there is both a need in society for renewable energy, a willing government, and a public demand*. Being a sustainability geek, visiting New York City was a dream come true. New York City has one of the most ambitious green infrastructure plans in the world –and they have a lot of green roofs, which I absolutely love. In fact, they plan to put green structure on 10% of NYC’s non permeable surfaces by the year 2030, this being in the form of green roofs, pocket parks and the likes. Green structure will function as both stormwater management, relieving stress on the sewer system, a rain water purifying filter and, where the green structure is in the form of a green roof, will save energy on both heating and cooling. The best part; it’s cheaper than fixing up the sewer system. Hurray! So little Miss ecogeek here was thrilled about visiting this magical green structure wonderland. I went there in late December 2010, 2 days before the big blizzard hit (lucky me for not stranding). If you’ve been to NYC in the winter, or any American city I fear, you will know that it is very draughty. I was shocked! Shocked and very cold. No matter what building I entered, I felt that draught. I started becoming obsessed with it, spotting the single layered windows, and the doors without weather strip, wondering how much, if any, insulation was in the walls. My green wonderland had turned out to be one big waste of energy. Not mine, but the inhabitant’s of New York. I kept thinking about all that heat and hence all the money slipping through the endless cracks, and unsealed doors in the buildings. To make matter worse, the buildings are heated by a local furnace or electrical heathers which are very energy inefficient compared to a heat- and power plant, where waste is burnt to create heating and electricity. Instead the NYC waste is going to landfill, and the buildings are being heated with non-renewable, and costly oil. My eco heart was broken. How could this be? I was fortunate to have lunch with a journalist one day, and we had a talk about it. I told him about the conditions in Denmark where we, as mentioned in a previous post, have fairly good insulation in our buildings. He said to me, “Yeah, but we didn’t have any wars, so we didn’t need to rebuild our city, and therefore didn’t put in more insulation, or double layered windows.” Then the lunch ended and so did the conversation. I couldn’t let it go, because well, Denmark didn’t have wars either. In Denmark, land of the cozy, we haven’t seen wars for 70 years. We’re a comfy crowd, and even in World War II when we were occupied by Germany, nothing got bombed. So why aren’t our buildings draughty? What caused Denmark to rethink and redo its energy system, was the oil crises of the 70’s, combined with a government with high focus on the environment, and a public demand for cheaper, safer energy. It’s a 3 point system, the tripod if you will. There must be a need in society, that pressures for action. There must to be a government who is willing to execute elaborate plans. And there must to be a public that voices and influences in which direction the plans should move. The 70’s oil crises shock the global notion that we will always have enough affordable oil. Let’s compare situations. Was the US affected by the 70’s oil crisis? Yes, but back then they had a rising oil production, so their outlook was that they could be almost self sufficient. Denmark on the other hand was in trouble. We needed something to free us from the dependence on forging oil (since we had none back then), and fast. The Danes got to work. Government investments and subsidies, created leading companies in the field of renewable energy and energy savings. Now you might say “Oh, but this is obviously the makings of a socialist state”. Well no, the government initiatives came as a response to the public demand for cheaper, safer energy, and of the public discourse that renewable energy was good, and nuclear power was bad. The public had a strong voice, rooted in strong, organized, cooperating environmental NGO’s. If you wanna keep being the elected official, you listen to that public voice, and you give them what they want. Of course by doing so you always risk losing voters that would rather have tax cuts than cheaper energy, so as an elected official, you must have the will to act. It’s common sense really, but 30 years later we forget why or how this change happened. To sum up, in order to achieve change in the energy sector there must be a need in society, a government that is up for a lot of policy making, and a public demand for change. Eventually a need in society will come by itself. We have a lot of potential scarcity crises waiting around the corner. It’s gonna hurt, but at least we will have one of the 3 pillars to push for change. Now all we need is a Government with willpower, and a public with a voice. Oh, by the way, I was writing notes for this in a draughty NYC apartment in lower Manhattan. I’ve separated need and demand in this post. You could ague that a need will trigger a demand, but this mostly goes for urgent needs. Once we, as a global society, are in urgent need of a more sustainable energy supply, it will be to late to efficiently, and smoothly make the transition. And on the other hand, you can have a public demand, that doesn’t necessarily have a matching need – like the public demand for a death star. I’ve mentioned before that meeting a future oil crisis most will likely hurt. But how can we prevent it, and what are the draw backs of those solutions? In Denmark, we look crisis in the eye, and underestimate it. So when we saw that the North Sea oil was running out, we established a climate commission that would work out how Denmark would become fossil fuel independent by 2050. The short version of the report can be found here, in english. I was fortunate to attend a lecture by one of the 8 people on the committee. Even more fortunate to receive one of his two hard copies of the climate report –I’m just that kind of gal. But back to the point. It is, according to the climate commission’s report, more than possible that Denmark become fossil fuel independent by the year 2050. And there was much rejoicing. However, there are circumstances. Most of the report promotes bio fuels, as the least expensive way to achieve this goal. In short bio fuels are extracted from either crops such as sugar or corn, or from byproducts, such as household kitchen waste or animal waste. And yes, animal waste is feces and urine. This creates biomass, from which bio- ethanol, biogas and other biofuels can be extracted. It is speculated, that if Denmark goes all in on Bio fuels, while the rest of Europe stand by and watches, we will make a great profit on biofuels, and will experience the wind turbine adventure part two. But if the rest of Europe follows, we will struggle to produce enough biomass to meet our own needs. Problem a) The definition of the system. In the above mentioned, the system only contains Denmark. If we assume that our surroundings won’t act as we do, we will make a huge profit. But can we afford to think like that? When planning for your country’s future energy supply, you need to examine the situation holistically, from start to end. You can’t discard the rest of the world. I’m pretty sure they too would like heat, gas, electricity and something to run their cars on. Bio fuel is great alternative to both fossil fuel and wind turbines, but we have to fully grasp their impact. Here an example. And yes, this really happened. When the facility was planed, built and then 3 years ago taken to use, there was no plan, non what so ever, for how to dispose of the sludge. So in 2010 they had been operating for 3 years and now their tanks were full. No one had thought of what to do with the sludge once the tanks were filled. Now, when they needed to make some space in the tanks, they just kindof… well, emptied them in the Nairobi river. Let that one sit for a bit. They did not foresee the eventual capacity of the tanks. There were no long term plans, and now all the sludge, all that human waste, is going into the Nairobi River. I wonder what else goes into that river? I wonder how many people wash themselves in that river? How could this happen? Is it the illiterate 3rd world countries that are just too far behind the tech curve to plan and operate such facilities? It must be, right? Nope. This project is a 1st to 3rd world aid project, like so many others. What whent wrong here, was communication and logistics. It was simply somebody else’s problem. Remember the global food crisis a few years back, when prices on corn and flower sky rocketed, sending millions of people into starvation? One of the main reasons for that was the increased use of crops to produce biofuel, which expanded the demand for corn and other crops that can be used for biofuels, making prices rise. If you’ve got your beat on the biofuel pulse you might be saying ‘Well, yes that was the 1st generation bio fuel. Then came the 2nd generation where byproducts from farming was used, and now the 3rd generation of biofuels, where algae is used instead of crops, is showing great potential’. Right you are. 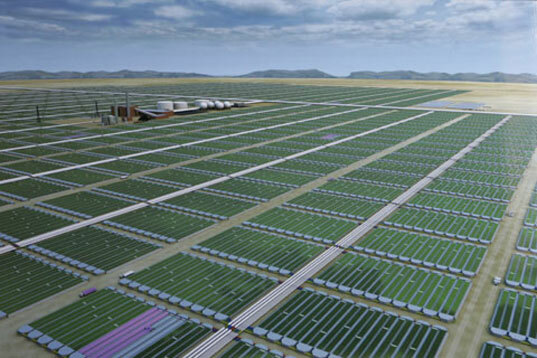 Algae holds a far greater potential energy that crops, without making food prices soar. However, you still need to produce a huge amount of algae if you want to provide fuel for the entire world. The algae has to be farmed, and this takes up a lot of space. The barren desserts in the U.S. have been suggested for mega algae farming facilities, which might look something like this. But it’s in no way enough to meet energy demands of the world, even if you place such farms in all barren, but accessible, regions of the world. Growing up we have all been told, that we should not put all our eggs in one basked. The future energy supply is not an exception. Betting on only one source of energy to sustain the energy need for tomorrow, whether it be wind power, biofuels, nuclear power or crude oil, will cause more problems than solutions. Holistic thinking, where more than just the neighbouring system is included. As well, viewing the full life cycle of your energy source, including resource availability and disposal of byproducts, is essential for securing energy and other resources. This along with global awareness, combined solutions and good communication will keep us from smashing all our eggs, that we so far still carry in one basket. Extra note on bio fuels, added January 22: On the 21nd the Los Angeles Times ran this article about how the EPA will now allow for up to 15% ethanol blended in gasoline for cars produced after 2001. This will on one hand shift the power balance a tiny bit, from a crude oil dependent future, to a more sustainable economy, and better yet, to a smooth transition. But it is still important to not view biofuels as the only way to a renewable energy source. Replacing one addiction with another is not a cure.